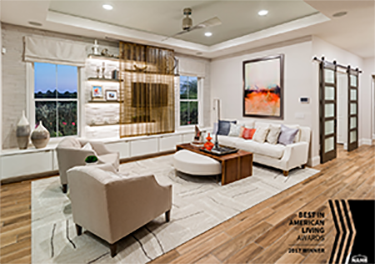 The NEXTadventure Home, with merchandising by Lita Dirks & Co., to be recognized in two categories at the 2018 Best in American Living Awards. The BUILDER Magazine Taylor Morrison NEXTadventure Home, located in Claremont, FL, has won a 2018 Best in American Living (BALA) award in two categories: Single-Family Production, 55+ and Interior Design, Production Kitchen. Given by the National Association of Home Builders (NAHB), awards, including platinum, gold, silver and Home of the Year, will be announced at the NAHB International Builders’ Show on January 10, 2018. The NEXTadventure Home showcases the future of the Boomer buyer market with inviting interior design, a thoughtful floor plan and the latest and greatest products/appliances from superior suppliers. Nationally-acclaimed firm, Lita Dirks & Co., was honored to have designed and merchandised this innovative show home. Award winners will be formally announced during the annual NAHB International Builders’ Show in Orlando, Fla. Additional Information about the BALA program can be found at bestinamericanliving.com. The 2017 Winners Portfolio, featuring design trends and project photographs, will be available online beginning January 10, 2018. The talented team of professionals at Lita Dirks & Co. has designed award-winning model homes, clubhouses, apartments, and sales/design centers for builders, developers and properties management companies throughout the country. Located in Greenwood Village, CO, Lita Dirks & Co. has successfully created long-term relationships with its clients by providing innovative design for more than 20 years.